This name uses Portuguese naming customs. The first or maternal family name is Duarte and the second or paternal family name is Rebelo de Sousa. Born in Lisbon, he is the eldest son of Baltasar Rebelo de Sousa (1921–2001) and his wife Maria das Neves Fernandes Duarte (1921–2003). He is named after his godfather, Marcelo Caetano, the last Prime Minister of the Estado Novo regime. Rebelo de Sousa is a Professor and Publicist specialized in Constitutional law and Administrative Law, earning his doctorate at University of Lisbon, where he taught Law. Rebelo de Sousa started his career during the Estado Novo as a lawyer, and later as a journalist. He joined the Popular Democratic Party, becoming a Deputy to the Assembly of the Republic. During that time, he helped draft Portugal's constitution in 1976. Later he rose to Adjoint Minister of Prime Minister Francisco Pinto Balsemão. Together with him he was a Co-Founder, Director and Administrator of the Expresso newspaper, owned by Pinto Balsemão. He was also the Founder of Sedes and the Founder and President of the Administration Council of another newspaper, Semanário. He started as a political analyst and pundit on TSF radio with his Exams, in which he gave marks (0 to 20) to the main political players. In 1989 he ran for Mayor of the Municipal Chamber of Lisbon (Mayor of Lisbon) but lost to Jorge Sampaio, though he did win a seat as City Councilor (Vereador). In that campaign he took a plunge into the waters of the Tagus River to prove they were not polluted despite claims to the contrary. Rebelo de Sousa was leader of the Social Democratic Party from 31 March 1996 to 27 May 1999 (some weeks before his election as party leader, he declared he would not be a leadership candidate, "not even if Christ came down to Earth"). He created a center-right coalition, the Democratic Alliance, with the People's Party in 1998. He became, however, the Vice-President of the European People's Party–European Democrats. The coalition did not please large parts of its own party, due to the role the People's Party leader, Paulo Portas, had in undermining Cavaco Silva's government while director of the weekly O Independente. Rebelo de Sousa resigned after Portas, in a TV interview, described a private talk they had had concerning this matter. Portas claimed Marcelo, as an anonymous source for O Independente, described in great detail a dinner where he was not present, down to the menu (which included vichyssoise, a cold soup); when Paulo Portas later reneged on the decision of the coalition established between their parties — which was made before that dinner — the term "vichyssoise" became a reference to that "revenge served cold". For these and other inconsistencies, he was called by Manuel Maria Carrilho political gelatin. A speech, in which he condemned the Portuguese habit of expecting a Messiah and a Dom Sebastião, was not well taken. The failure of the coalition led to his public and televised demission. In other local elections, he also became the President of the Municipal Assembly of Cascais and the President of the Municipal Assembly of Celorico de Basto. He had a weekly program of political analysis every Sunday on public TV station RTP after previously having a similar program on the private TV station TVI, where he was introduced as being "the wisest and most perspicacious political analyst of current times". His comments covered everything from politics to sports, including his famous presentations and comments on the newest published books, and they were sometimes controversial, some of the comments being seen as personal and political attacks. In his analysis, still in TVI, he often attacked Pedro Santana Lopes, accusing him of being "truculent, a cudgeller and resentful", and not "having the profile to be a President of the Republic". This animosity remained until after Santana Lopes became Prime Minister, with a particular commentary on his performance finishing with the statement that he was "worse than the worst Guterres" and that he was "making Guterres look better and pushing them to Belém", leading to a response from Santana Lopes' Government Speaker Rui Gomes da Silva, who accused him of an "involuntary cabal". The president of the network, Miguel Pais do Amaral, asked in a private dinner that Marcelo be more moderate in his attacks, something that Marcelo took as a form of censorship, leading to his exit from the program and the channel. It was after that episode that he was hired by RTP. Partially in consequence of these events, President Jorge Sampaio dissolved the Assembly of the Republic, a move that also meant dismissing the Government at a time when it had a stable coalition majority, and calling for anticipated elections, which led to the defeat of Santana Lopes and the election of the Socialists under José Sócrates. In 2010, he left RTP and returned to TVI to do the same program that he had before. He was made a Member of the Council of State, by President Cavaco Silva, and was sworn-in on 6 April 2006. He was a leading figure on the pro-life side of the 2007 abortion referendum. He even founded a website titled "Assim Não" (Not like this), which was divulged with a famous introductory video. It become so well known that it was parodied in Saturday Night Live-fashion by famous humour group Gato Fedorento. On 24 January 2016, Rebelo de Sousa was elected as President of Portugal in the first round of voting. He stood as an independent, appealing for moderation and cross-party consensus. During his election campaign, he promised to repair political divisions and the hardship of Portugal's 2011–14 bailout. Unlike his predecessor, Anibal Cavaco Silva, he had never previously held a top state position. Following a historic agreement with the Republic of Portugal in 2015, His Highness the Aga Khan IV officially designated the premises located at Rua Marquês de Fronteira in Lisbon — the Henrique de Mendonça Palace — as the Seat of the Ismaili Imamat on July 11, 2018, and declared that it be known as the "Diwan of the Ismaili Imamat". Marcelo Rebelo de Sousa has also offered the Aga Khan Portuguese nationality. Marcelo Rebelo de Sousa, President of Portugal, with Vladimir Putin, President of Russia, in the Kremlin in Moscow, 20 June 2018. 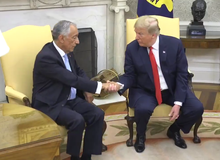 Marcelo Rebelo de Sousa with Donald Trump, the President of the United States, in the White House in Washington, D.C., 27 June 2018. For a more comprehensive list, see List of international presidential trips made by Marcelo Rebelo de Sousa. Marcelo Rebelo de Sousa, as President of Portugal, has visited the Vatican, Spain, Mozambique, Morocco, Brazil, Switzerland, Cuba, United Kingdom, Greece and Angola. The first visit was to the Vatican City to meet the Pope Francis and the Cardinal Secretary of State Pietro Parolin. On 28 December 2017, Marcelo Rebelo de Sousa was admitted at Curry Cabral Hospital, in Lisbon, where he was subjected to a surgery to treat an umbilical hernia. The procedure was performed by Eduardo Barroso, a veteran surgeon who is also a close friend of the President since early childhood. After the surgery, Barroso informed the press that all went well and that Marcelo's condition had been known for at least six years, also referring that the surgery was initially due to occur on 4 January 2018. However, on the morning of 28 December, the President felt abdominal pain, and an examination by his official physician, Daniel Matos, revealed that the hernia was incarcerated and required immediate surgery. On 29 December, the Presidency official website published a clinical report, informing that Marcelo was cheerful and recovering well. Marcelo Rebelo de Sousa was discharged from hospital on 31 December by 12:45 PM, and left the premises by his own foot, while greeted and applauded by some hospital staff and other patients. He lauded the Portuguese National Health Service, considering it an important conquest of democracy. On 23 June 2018, Marcelo Rebelo de Sousa felt indisposed and collapsed after a visit to Bom Jesus do Monte sanctuary in Braga, in a day where temperatures were close to 40ºC. He was transported to the hospital where, after several exams, it was revealed the incident was caused by a sudden drop in blood pressure alongside an acute gastroenteritis. He was discharged from hospital later on the same day and was told to rest for some days. Grand Master of the Honorific Orders of Portugal (2016 – present). Grand Cross of the Order of Prince Henry (9 June 2005). Commander of the Order of Saint James of the Sword (9 June 1994). Grand Cordon of the Order of Leopold (22 October 2018). Grand Cross of the Order of Stara Planina (30 January 2019). Grand Cross of the Grand Order of King Tomislav of the Republic of Croatia (4 May 2018). Grand Cross of the Legion of Honour of the French Republic (26 August 2016). Grand Cross of the Order of the Redeemer of Greece (21 April 2017). Knight Grand Cross with Cordon of the Order of Merit of the Italian Republic (29 November 2017). Knight (single order) of the Order of the Gold Lion of the House of Nassau of the Grand Duchy of Luxembourg (23 May 2017). Collar of the Order of the Aztec Eagle (17 July 2017). Knight Grand Cross of the Order of the Netherlands Lion of the Kingdom of the Netherlands (10 October 2017). Grand Cross of the Order of the Republic of Serbia (25 January 2017). Knight of the Collar of the Order of Isabella the Catholic of the Kingdom of Spain (25 November 2016). Collar of the Order of Charles III of the Kingdom of Spain (13 April 2018). Knight with the Collar of the Order of Pius IX of the Vatican City State (Vatican, 7 July 2016). He separated later in 1980, but has never divorced due to his religious belief. He has started dating his former pupil, in the 1980s, who was at the time his fellow lecturer at the Faculty of Law of the University of Lisbon. They are still dating, but living separately. He claims to sleep only 4 to 5 hours daily. He also claims to read 2 books a day, and is an avid surfer at the Guincho Beach in Cascais, on the Portuguese Riviera. He has stated to be a fan of classical music, especially of Giuseppe Verdi. ^ "President says Portugal must respect EU, avoid return to crisis". 9 March 2016. Retrieved 25 December 2018 – via www.reuters.com. ^ Vince Chadwick (January 24, 2016), Portugal elects Rebelo de Sousa as president Politico Europe. ^ "Presidente deu posse a novos membros do Conselho de Estado". Presidência da República Portuguesa. Retrieved 3 February 2018. ^ Vídeos Perdidos. "As razões do Assim Não (Marcelo Rebelo de Sousa)". Retrieved 25 December 2018 – via YouTube. ^ RTP. "Assim Não (Marcelo Rebelo de Sousa)". Retrieved 25 December 2018 – via YouTube. ^ Paul Ames (January 24, 2016), 5 takeaways from Portugal’s presidential election Politico Europe. ^ Axel Bugge (March 9, 2016), "President says Portugal must respect EU, avoid return to crisis" Reuters. ^ "Vaticano: Marcelo Rebelo de Sousa em audiência com o Papa Francisco". Agência Ecclesia (in Portuguese). 17 March 2016. Retrieved 29 June 2016. ^ Ribeiro, Nuno (16 March 2016). "Marcelo inicia hoje visita oficial ao Vaticano e Espanha". Público (in Portuguese). Retrieved 29 June 2016. ^ "Marcelo chegou a Moçambique". TVI (in Portuguese). 3 May 2016. Retrieved 29 June 2016. ^ "Em Marrocos, a falar de energia, 'Brexit', Espanha e sanções". Público (in Portuguese). Lusa. 28 June 2016. Retrieved 29 June 2016. ^ "Marcelo Rebelo de Sousa em visita oficial ao Brasil". Rádio e Televisão de Portugal (in Portuguese). Retrieved 20 November 2018. ^ Lusa, Agência. "Em visita oficial a Londres, Marcelo Rebelo de Sousa encontra-se com financeiros e primeira-ministra". Observador (in Portuguese). Archived from the original on 20 November 2018. Retrieved 20 November 2018. ^ "Portugal's President Marcelo Rebelo de Sousa visits Greece | The Greek Observer". The Greek Observer. 13 March 2018. Archived from the original on 20 November 2018. Retrieved 20 November 2018. ^ "Marcelo Rebelo de Sousa internado em Lisboa para ser operado de urgência". www.dn.pt (in Portuguese). Diário de Notícias. Retrieved 30 December 2017. ^ "Marcelo operado por Eduardo Barroso". www.sabado.pt (in Portuguese). SÁBADO. Retrieved 30 December 2017. ^ "Boletim Clínico do estado de saúde do Presidente da República". www.presidencia.pt (in Portuguese). Presidência da República. Retrieved 30 December 2017. ^ "Marcelo Rebelo de Sousa já teve alta e foi aplaudido à saída". www.dn.pt (in Portuguese). Diário de Notícias. Retrieved 1 January 2018. ^ "Marcelo sofre quebra de tensão e desmaia durante visita em Braga". www.jn.pt (in Portuguese). Jornal de Notícias. Retrieved 23 June 2018. ^ "Nota da Presidência da República". www.presidencia.pt (in Portuguese). Presidência da República. Retrieved 23 June 2018. ^ a b "Cidadãos Nacionais Agraciados com Ordens Portuguesas". Página Oficial das Ordens Honoríficas Portuguesas. Retrieved 13 July 2016. ^ a b c "Página Oficial da Presidência da República Portuguesa". www.presidencia.pt. Retrieved 18 April 2019. ^ "La reina Matilde de Bélgica, una burbuja Freixenet en su cena de gala en Portugal". El Confidencial. 23 October 2018. Retrieved 25 December 2018. ^ a b "CIDADÃOS NACIONAIS AGRACIADOS COM ORDENS ESTRANGEIRAS – Página Oficial das Ordens Honoríficas Portuguesas". www.ordens.presidencia.pt (in Portuguese). Retrieved 27 July 2018. ^ "Vabariigi President". president.ee. Retrieved 18 April 2019. ^ a b "CIDADÃOS NACIONAIS AGRACIADOS COM ORDENS ESTRANGEIRAS". Página Oficial das Ordens Honoríficas Portuguesas. Retrieved 8 January 2017. ^ "CIDADÃOS NACIONAIS AGRACIADOS COM ORDENS ESTRANGEIRAS – Página Oficial das Ordens Honoríficas Portuguesas". www.ordens.presidencia.pt (in Portuguese). Retrieved 22 February 2018. ^ "Le onorificenze della Repubblica Italiana". www.quirinale.it. Retrieved 25 December 2018. ^ "ACUERDO por el que se otorga la Condecoración de la Orden Mexicana del Águila Azteca, en grado de Collar, al Excelentísimo Señor Marcelo Nuno Duarte Rebelo de Sousa, Presidente de la República Portuguesa". Diario Oficial de la Federación (in Spanish). Archived from the original on 20 November 2018. Retrieved 20 November 2018. ^ "Serbian and Portuguese presidents exchange decorations - English - on B92.net". B92.net. Retrieved 25 December 2018. ^ "Boletín Oficial del Estado" (PDF). Retrieved 18 April 2019. ^ "Real Decreto 223/2018, de 13 de abril, por el que se concede el Collar de la Real y Distinguida Orden Española de Carlos III al Excelentísimo señor Marcelo Rebelo de Sousa, Presidente de la República Portuguesa". Boletín Oficial del Estado (in Spanish) (91): 38968. 14 April 2018. ISSN 0212-033X. Retrieved 16 April 2018. ^ "Quem é a mulher que não quer ser primeira-dama?". www.sabado.pt. Revista Sábado. Retrieved 12 March 2016. 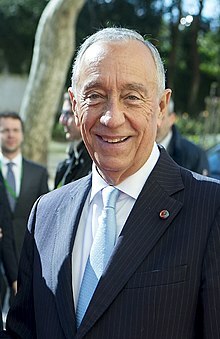 Wikimedia Commons has media related to Marcelo Rebelo de Sousa. This page was last edited on 20 April 2019, at 12:20 (UTC).